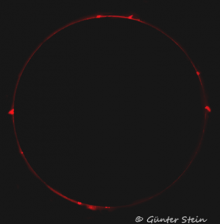 With the BelOptik coronagraph or solar prominence viewer you can observe chromospheric details like protuberances on the edge of the sun in very high contrast. The device generates an artificial solar eclipse and reduces stray light from the lens of the telescope through an iris baffle. A conical baffle in the telescope focus completely hides the sun. 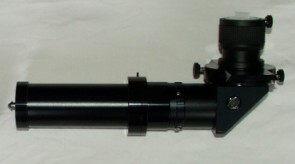 The cone is mounted on a second auxiliary lens. 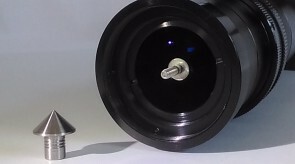 This lens projects the main objective on an adjustable iris baffle. This iris baffle will be closed to reduce light scattering from the edge of the main lens, so far that the background is dimmed. 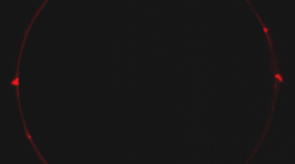 A projection objective is arranged behind the iris aperture. With an eyepiece in secondary focus of the projection lens you can see the edge of the conical baffle. 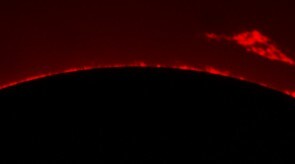 A very narrow band interference filter (FWHM <1nm = 10A) between the projection lens and the eyepiece allows the observation of solar prominences in wavelength of ionized hydrogen on the edge of the cone. The filter is mounted in an adjustable tilt cell. 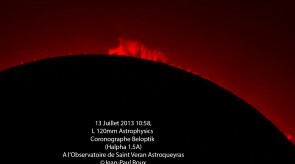 The prominences of the sun will be visible in high contrast against a dark background. 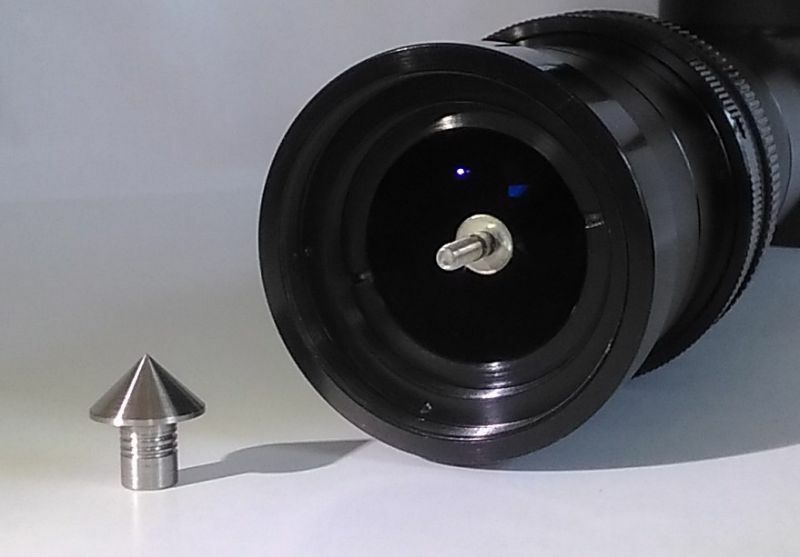 The coronagraph will be mounted directly on the focuser of the telescope with T2 thread or 2 inch connection. 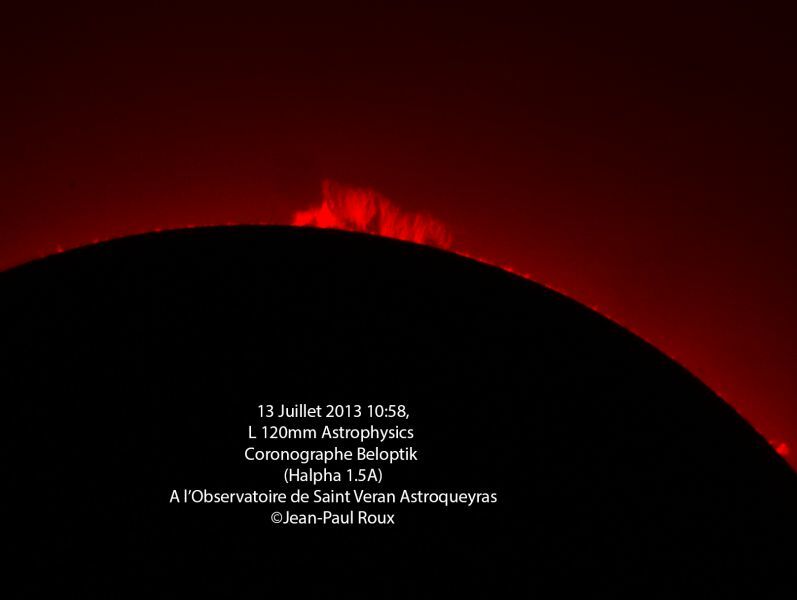 The sun changes its apparent angular diameter in the sky during a year. Therefore I deliver at least four different cone aperture diameter. These cones can be simply screwed onto a thread in the auxiliary lens. Tip: Use an equatorial mount with motorized tracking system because the observation and handling is easier and glare can be prevented. 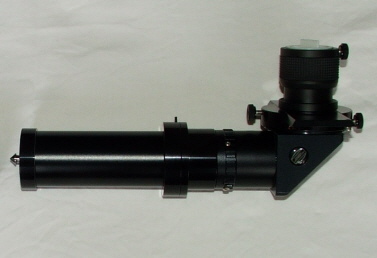 The optical components are multi coated and with blackened edges and the tubes based on T2 mount system. The coronagraph is delivered in a padded Al case.